Azodyl dietary supplements help support kidney function in dogs and cats by fighting uremic toxin buildup and slowing the progression of chronic kidney disease. Azodyl pet meds provide natural Enteric Dialysis with beneficial bacteria. Azodyl® is a breakthrough, non-prescription medication that helps support kidney health. Each coated Azodyl tablet contains a patented formula of beneficial bacteria that reduce toxin build up in the body. Natural formula supports healthy kidney function For dogs and cats Fast acting, safe, and no side effects Small capsules are easy to dose The kidneys do critical work, filtering waste and toxins from the body. But if your dog or cat?s kidneys aren?t functioning properly, then the kidneys could be damaged and other problems can occur. If your pet needs renal (kidney) support, talk to your veterinarian about Azodyl, a nutritional supplement that supports kidney function. The patented, naturally occurring beneficial bacteria in each Azdoyl capsule work to flush toxins out of the bowel and blood and slow further toxin build up in the body. METHOD OF ACTION: Helps support normal function and health of kidneys TREATMENT: This treatment is important for pets with Chronic Kidney Disease (CKD), which begins with azotemia. Azotemia occurs when nephrons decline and non-protein nitrogenous compounds build up, impairing the kidney's ability to filter and eliminate waste. 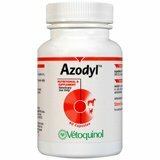 Azodyl helps reduce azotemia and slows the progression of CKD. Azodyl is safe to use and is compatible with other therapies. 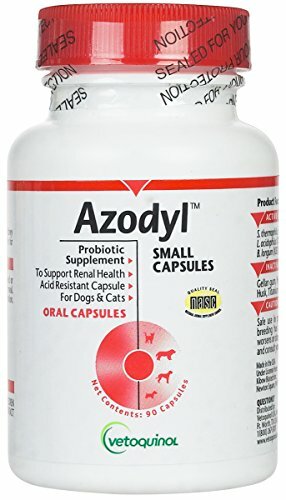 Benefits Over Azodyl Same amount of probiotic bacteria as the larger size capsules In a 50% smaller capsule for easier administration Ideal for small dogs and cats, but can be used in any size animal Same enteric coated capsule as the larger size capsule Same administration directions as the larger size capsule Larger capsule count per bottle for long-term administration Azodyl FAQ NOTE: Azodyl Shipping includes ice packs and is shipped via Express 1-2 Days which is the best way to ensure Azodyl is received at a cool temperature. Other shipping methods are not guaranteed to arrive quickly or cold. Must shipped Express 1-2 Days. A $29.95 flat rate fee is charged for all orders. Someone should be present to sign for and receive the order when it ships to you. For more shipping info click here. Azodyl Renal Function Support Through Enteric Dialysis. 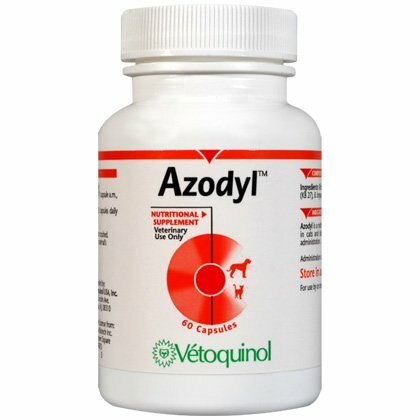 Azodyl Caps helps to slow down uremic toxin buildup and prevent further kidney damage in dogs and cats. It is a breakthrough in veterinary product. It works by providing natural Enteric Dialysis through the use of beneficial bacteria that support kidney function. The treatment choice at the first signs of azotemia in dog and cats with acute or chronic kidney disease. Patented formula of naturallyoccurring beneficial bacteria that metabolize and flush out uremic toxins that have diffused into the bowel as a result of increased toxin levels in the blood. Easytoadminister, entericcoated capsules. Can be used with other treatments and/or products, such as Epakitin. Animals weighing up to 5 lbs: Give 1 capsule Daily Animals 510 Lbs give: Give 2 capsule daily (1 capsule AM and 1 capsule PM) Animals weighing greater than 10 lbs: Give 3 capsules daily (2 capsule AM and 1 capsule PM) Capsules should be given whole and not opened/crushed. If necessary administer capsules with a piece of the animals favorite food or treat.Special Storage Delivery Instructions: Azodyl is required to be shipped on ice. Store Azodyl in the refrigerator. Keep this medication out of the reach of children and pets. Urinary Tract & Kidneys, New hope for compromised kidneys through targeted use of beneficial bacteria. Introducing Azodyl, breakthrough bacterial product for the reduction of azotemia in dogs and cats. Refrigerated item, requires overnight shipping.